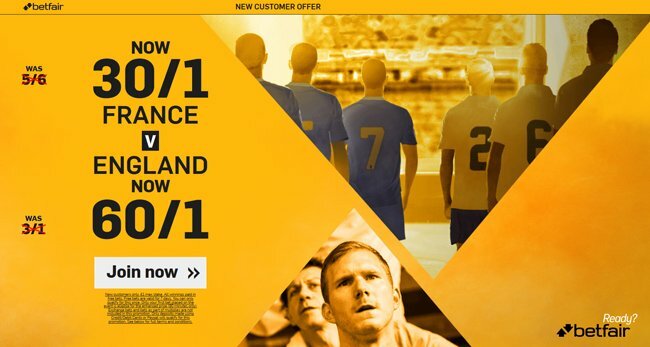 Join Betfair via this page and claim crazy odds on Tuesday's International Friendly France v England! Find here how to back 30/1 France to win or 60/1 England to win, plus money back if you lose! Max bet €/£1. France have only lost one of their last seven games against the Three Lions winning four and drawing two of the other fixtures. Anyway, England recorded a 2-0 victory when they last met at Wembley 19 months ago, courtesy of goals scored by Dele Alli and Wayne Rooney. Take advantage of the latest enhanced odds on this International Friendly! 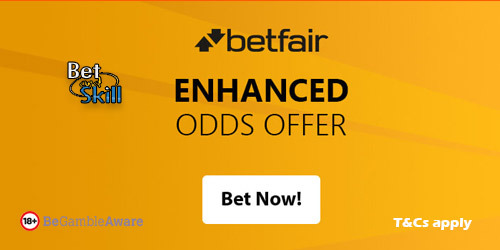 Find below how to get 60/1 France or 30/1 England to win at Betfair! Place your first bet (max £/€1) on France or England to win Tuesday's International Friendly! • Only deposits made using Credit/Debit Cards or Paypal will qualify..
• Place a bet on France or England in the 'Match Odds (90 mins only)' market at the enhanced price. • Winning Example: Enhanced 25/1 x max £1= £25 paid in FREE BETS plus £1 qualifying stake returned as CASH. "Claim 30/1 France or 60/1 England to win at Betfair! Risk-free!"